I was so happy when my parents told me they were coming to town for the long weekend. After the post-Pakistan blues, I knew that seeing family would give me a boost. 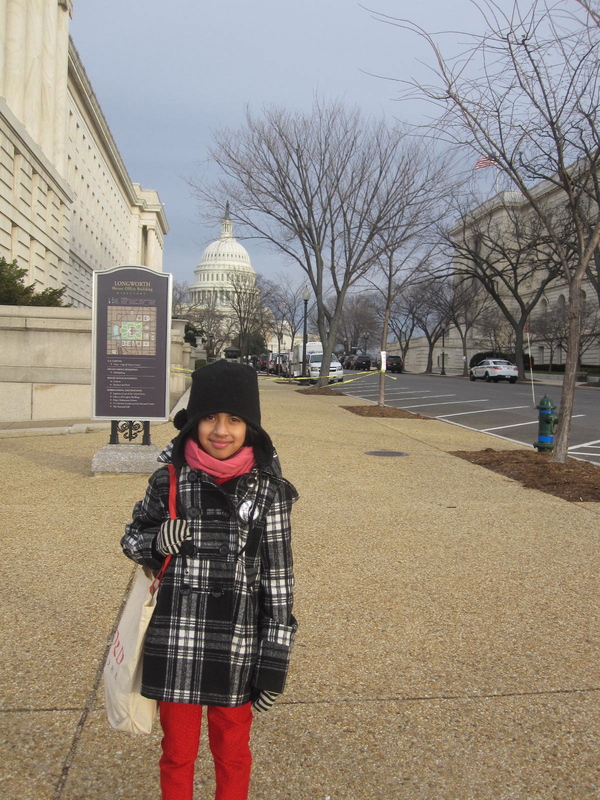 Since they were driving, I suggested they bring along my eight- year-old cousin who had never been to DC before. A little background on my cousin, D. When we went to Michigan in October, she kept asking me to sleep over. I told her I couldn’t sleep over that time but I would sleep over when we came back for Thanksgiving. This girl set up a countdown and dutifully marked off each day until we would be coming back to Michigan. She called me to remind me that I had said I was going to be sleeping over and proceeded to give me a hour by hour break down of what she had planned. She also told me that she had all the snacks ready for the sleepover- which was still two weeks away. When I talked to my aunt on Saturday morning, she told me that D was especially excited to meet President Obama. She assumed that everyone in Washington DC hangs out with the President. As luck would have it, my wonderful neighbor Billy had called the night before offering us two tickets to the inauguration. I initially had planned to go with my dad but he insisted that I take D who was so excited to “meet” the President. What a great guy! 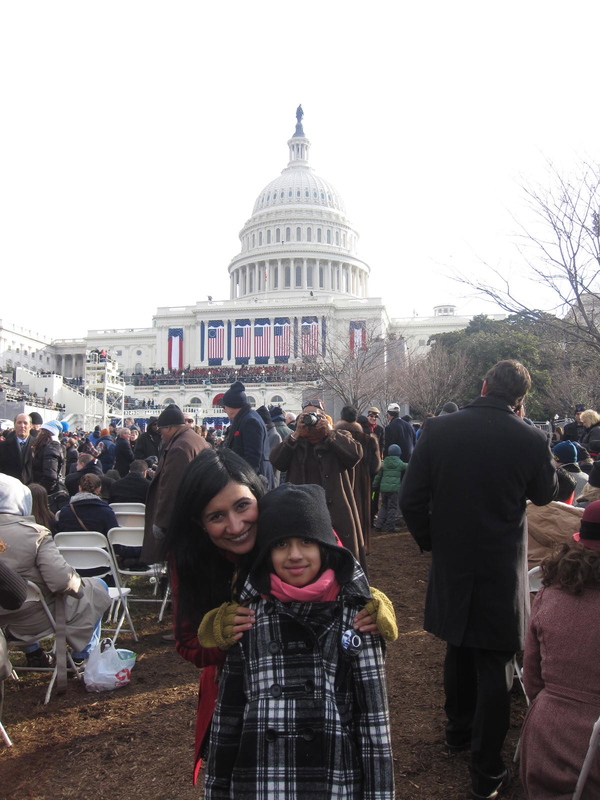 The first inauguration experience for both of us. D got up at six in the morning and put on her sparkly top and bow headband in record time. I didn’t go to the inauguration in 2008 but I did go to the Stewart/Colbert rally a few years back and I was afraid that DC would be a total mad house. I was more than a little scared of losing my aunt’s only child so I gave D a long lecture about sticking close to me. I wrote my phone number on a piece of paper and put it in her coat pocket. Then, for good measure I wrote it across her arm too. I explained to her that if she got separated from me, she should immediately find a woman and ask her to call me. Then, for reallly good measure, I made her memorize my phone number. D on her first metro ride. We were initially going to try to walk most of the four miles but it was so cold outside that I decided we would take the metro. I was so scared of losing her down there or her getting crushed! There was absolutely no reason to worry. The metro was so quiet that I was sure it was closed down or not going to the inauguration. But it was running a-ok and we got a seat no problem. I made D carry a bag full of snacks and extra hats and gloves. No free rides around here! Once we got off the metro, there were tons of signs and there were volunteers all over the place. We got through security painlessly. The only strange thing was that they had everyone turn on their cameras and looked through the viewfinders. Once we got to our section, I got us some seats at the end of a row. Even though it meant we had to sit a little farther back, it meant that we could easily come in and out if we had to go to the bathroom or get up and stretch. We had over two hours to wait before the speeches started. We took pictures, danced in the aisle and watched the man who climbed forty feet up a tree so he could heckle the President and everyone else while they spoke. This will definitely go a long way to ending abortion. Definitely. The police tried to talk him down and even brought a ladder but he just kept going higher. Finally, it was time for the Vice-President and President to be sworn in. Here is the President giving props to immigrants like D and me. I hope this year will finally bring long overdue immigration reform. Come on, Congress and Mr. President! There are so many people counting on you! D was a great sport throughout everything. She didn’t complain about the cold, the long wait or even the fact that she didn’t understand most of what was being said. What a champ. For me, the best part of inauguration was when I found out D had no idea who Jay Z or Beyonce were. Before we knew it, it was all over and we made our way through the crowds to get back on the metro. After a few stops, I realized that there would be too many delays and decided we would get off and walk home. To keep D going, I stopped at Potbellys to get her a cookie and… we ran into Obama! D got this sweet picture. This is actually an old picture of Nadi praying in Singapore or Malaysia. When we were re-routed, our layover went from about two days to just under 18 hours. In a normal airport, 18 hours may be doable but in Jeddah, it was truly difficult. There is one large Duty Free shop, a coffee shop and a ‘restaurant.’ There were people sleeping all over the place and not a single decent thing to eat in the airport. There was also a prayer area that ended up being the most entertaining part of the airport. I went to the small prayer area to take a nap and a few other women had the same idea. At Fajr, I heard people coming in so I got up to make room for people to pray. Soon the whole area was almost full. A group of women came in and there was not quite enough room for them to fit in. They noticed that there was a woman sitting in the back with containers of food all around her. Acting oblivious to everything that was happening, she continued to eat even as people were looking for a place to pray. An older woman went up to her and asked her to move since people were trying to pray. She looked up defiantly and said “I’m. Eating.” The older woman told her to look around and to make room. The woman replied, “This is not your business. Get away from me.” The older woman was upset at this point and asked her if she thought this was a restaurant. At this point the younger woman started shouting and I made my exit not wanting to be in a small crowded room with these women. Later that day, I went in to the prayer room to pray my Zuhr. The younger woman was still sitting there gossiping loudly with two new friends she seemed to have made. With the air of someone who is not actually important she said in her heavily accented voice, “I’m sure you have heard of where I’m from. Its Chicaggoooo. Its a verrrrry big city.” Then she looked at the others with a smirk. She carried on talking about how important she was and every few minutes one of her kids would come into the room needing something of her and she completely ignored them. I mean, didn’t even look their way as they yelled, “Mommy, Mommy.” Since they called her Mommy and not Amee, I could see that she was very modern indeed. You might be thinking, Sumeera this seems like a pretty mean spirited reflection. Are you being fair to this woman? The truth is maybe I’m not. Up to this point, I had just been observing her with a slight curiosity in an otherwise uneventful airport. As her children ran around, I started my prayer. But then. Then she says, “This room needs some music.” She takes out her phone and starts playing badly recorded Hindi songs on full audio. Keep in mind there are several other women praying as well. Then she starts humming along. And painting her nails. As far as I know, she continued to do this for the rest of her layover. How do people become this way? How are they unaware of how rude they are being? Where do they come from? Oh yeah… Chicago. Over the next few weeks, I will be doing a series of posts about my recent trip to Pakistan and the impact it had on me. I hope you will drop by and read some of the stories. In 2005, I visited Pakistan to conduct research for my senior thesis. When I left, I told my family, I’ll be back before they knew it. Probably in six months. Definitely within the year. I told them I would bring Feraz! Over the next seven years, I graduated from undergrad, started my first real job, went to law school, moved to Istanbul and then to DC. I did so many incredible things but I did not go to Pakistan. In March of 2012, my maternal grandmother had a stroke, leaving her unable to speak or walk. Those seven years seemed like a vast ocean of time and space in which lingered so many opportunities to have visited Pakistan. I realized how I would never get a chance to go back and visit like I should have. But I could go now. We took care of our visa and at the end of November, we booked out tickets to Islamabad. We decided to go through Saudi Arabian Airlines so we would be able to perform Umrah on the way there. What we didn’t realize at the time was that it would be almost impossible to get a visa to Saudi in December. Feraz tried to apply for every type of visa- an Umrah visa, a transit visa and a visa to visit family members. Unfortunately, December is not a good month for US citizens to visit Saudi and eventually all our visa requests were unsuccessful. The worst part was that we didn’t find out until Friday, December 21st. The day our flight was scheduled to leave. I called Saudi Airlines to see if we could be put on a standby flight once we arrived in Jeddah. They told me that we wouldn’t be able to board the plane in DC without a visa. Saudi immigration policy doesn’t allow anyone to stay in Saudi, even at the airport, for more than 18 hours without a visa. I felt panicked. I called Feraz who was at Jummah prayer but he didn’t pick up. Our plan had been to leave at 2 o’clock when he got home for the 6 o’clock flight. I called Orbitz to see if we could change our ticket. They told us it would cost a couple thousand after penalties and price adjustments to change the ticket. To that point, I hadn’t believed that we would actually be going to Pakistan and it seemed that my doubt had been well founded. When Feraz got home, I was angry. We weren’t going to be able to go. We were going to lose over $3,000 on our ticket. And we weren’t going to be able to see my grandma. Feraz suggested we go to the airport and see what the airline could do. We trudged our four suitcases across a very windy Key Bridge to the Rosslyn metro where we caught the bus to Dulles. The bus was so overfilled but we luckily managed to squeeze on. We stood the whole way as I nervously played out different scenarios in my mind. All of them ended with us not going to Pakistan. Once we got to the airport, we immediately went to the Saudi ticketing counter. Let me say this publicly. Saudi Airlines has the best customer service I have ever experienced from an airline. They immediately recognized the problem when I showed them the itinerary and there was no discussion, they just said, we are going to take care of it. As long as there was a free seat on an earlier flight out, they would reroute our ticket. $160 and less than an hour later, we were set to get on our flight. It was official, we were going to Pakistan! Today Feraz and I woke up still in a funk. We miss Pakistan so much and it is difficult to adjust to life in a cold city like DC. It is about as far as you can get from Pakistan and not necessarily in a good way. I decided that we had to be proactive about feeling better and suggested we get out and about. We started walking along the C&O Canal and ended up wandering around in some amazing neighborhoods. As we walked by the rows of BMWs, Audis and Subarus, we talked about what a different world this is than the one we just left behind. In Pakistan, we may have missed comforts of home like hot water and heat but having them does not fill the hole of community and family we feel in DC. We talked about how over-scheduled people are. How a simple coffee date can take weeks to set up. But as we walked and talked, I realize that we are each others family and we are so lucky to have each other. To be like minded and to have the same priorities in life. By the end of our walk, I felt at peace. On the way home, we noticed a man looking into the canal and taking pictures. We stopped and saw that there was a great blue heron hunting its lunch. It was so amazing to watch it patiently wait, dash its long beak in the water and come up with a fish. The water in the canal is so shallow right now that I didn’t think that there was anything swimming in it at all. The first fish that the heron caught was a little big and it held it in its beak until it could turn the fish around and swallow it whole. We stayed and watched it for a while. It found another little fish and gobbled it whole. It was a good moment and I realized that it is possible to have good moments wherever you are. After a cold spell, our last day in Pakistan was filled with the beautiful relief of sunshine. That night, we went on the roof with my baji and little cousins and looked at the stars as they covered our sleepy village. The electricity was gone and the black night sky was more filled with stars than I have ever seen. It felt like the whole galaxy was about to drop down on us. I so badly wanted to hold on to that moment. To make sure that age and experience did not push it to some inaccessible recess of my mind. Today is our first day back in America and I cannot express how sad my heart is to be away from my cousins, grandparents and the rest of the family.